The Man and I wanted to kill it and be done with it. But family members were softer hearted than us and insisted that we just relocate him. So they took him in the trap on a very long drive and let him go. Yesterday I was at the farm while our new countertops were being installed and The Baby came running in telling me there was an animal in the trap. I went to look and guess what... It was another badger. How the heck does a badger die in a cage all by himself? I've no idea, but he did. So The Man buried it. And the kids sang a hymn. And The Girl laid a flower on it's grave. So yeah... this whole farm living thing is setting in hard and fast! The thing I'm most looking forward to is decorating the new farmhouse. Will you go to my friend Sarah's blog and leave a comment that just says "Badger"? Pretty please? I'll love you forever. We have a running badger joke and I know it won't take her long to figure out where you're all coming from. Plus her blog is stinking awesome and you'll be hooked from now on. I promise to stop posting pictures of rodents soon. Update: I was wrong!! Donna correctly pointed out in the comments that this is a woodchuck, not a badger. We actually debated it, as a family, when we first caught him in the cage. Some family members insisted it was a badger. Others thought it wasn't, but didn't know what it was. Thank you Donna for clearing up the mystery for us!! There's still talk of badger sightings on our property (from people more knowledgeable than our non-farm family...) So we immediately assumed that this was him. And we'll be on the lookout for the real deal. You guys, he was HUGE! 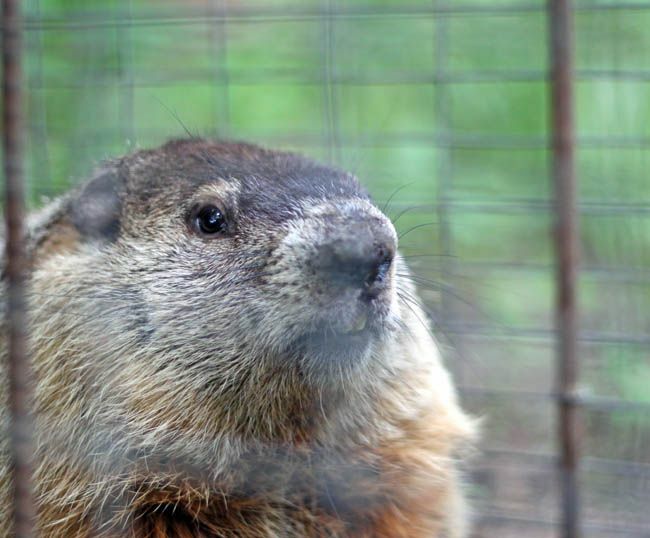 Websites say groundhogs are up to 14 lbs. or so and this puppy was way bigger than that! And the second one (the dead one) was even bigger. ?? Weird. p.s. No, I didn't edit out the bar in front of his face. He had it in his mouth, trying to chew through! He'd stand up on his back legs, grab ahold of the cage like that and shake it back and forth. but really i'm so envious!! Mr Badger is adorable. Look at how smart he is. I want one. Maybe I'll knit one. ok...did you photoshop the metal bar out of that picture so we could really see his nasty face? or did he BITE through it? 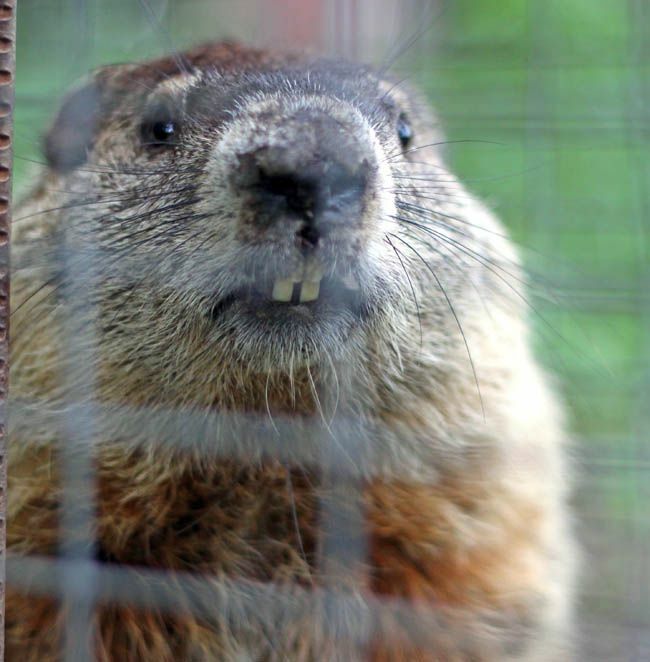 Honey, I hate to take issue with your posts about this critter, but as one who hails from Wisconsin, The Badger State, I have to tell you that your animal is a woodchuck. They're a nuisance, but not as mean and scary as a badger, to be sure. I certainly don't mean to take issue with your identification, but you might be able to understand my confusion from looking at your photos. Either way, I'm glad you've rid your barn of this inhabitant and hope they don't bother you again. oh my gosh is a badger what was in our windowsill? i just posted pics on my blog! ha! they look similar. i'm glad you caught this mischievous little guy! 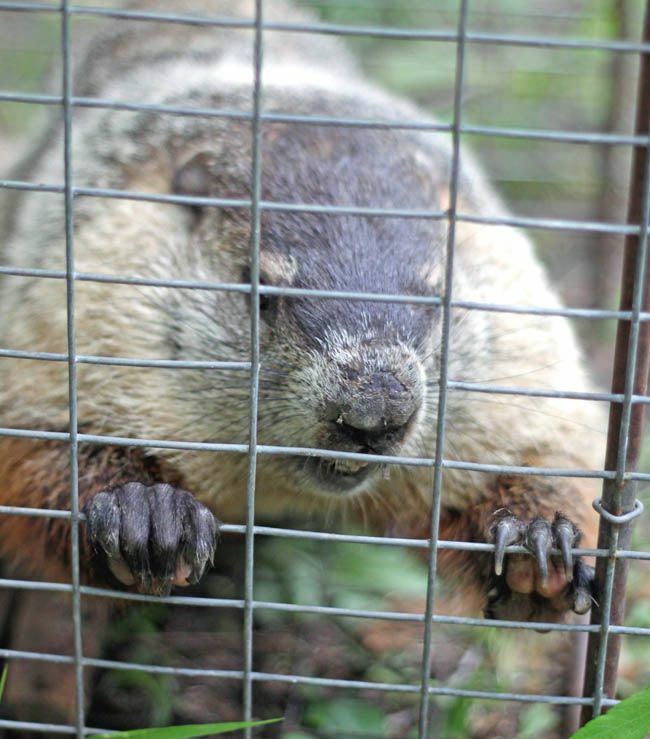 You know, you could have held on to the little guy until next Feb. and had your very own Groundhog's Day festival. Bummer. Ya, I saw your title Badger and then the picture popped up, so I thought your title was just teasing us! If you think this guy is ugly, just wait until there is an actual badger in your trap! Yikes! They are mean little suckers! Oh you are going to get it and get it GOOOOOOOOOD!!!!!!!! I have had a ton of spam over the past two days, and I was reading the comments thinking, what. in. the. HECK? Now there's BADGER spam??? And it only took me about 20 seconds to figure it out. Or maybe two minutes. I'm smart. You made me laugh SO FREAKING HARD and I love you so much! I hope you have lovely dreams about badgers/woodchucks/moles/groundhogs/whatever-the-heck-they-are tonight. I didn't think it looked like a badger..and plus they are mean and this little guy does not look so mean! Too bad he dies but nice of you guys to give him a funeral! This is most definitely NOT a badger. It's kind of cute little guy though. Could be gopher, but not badger. The fact that you have two means you probably have more. What ever happened to Mr. Skunk? Did he relocate? In this case you would want a badger, he would keep the skunks away, but they are mean and dangerous, so maybe not. Was that LONG DRIVE all the way back to PA? Hmmmm Mr. Woodchuck up close and personal!! Mr Woodchuck is my number 1 enemy because he ate all my veggies last year!! Happy weekend! You'll have to "google" badger to see what they really look like. That picture is too cute a guy. A badger chased my husband once when he got off the tractor in the middle of the field. He had to run and jump on the tractor to keep from being mauled. Great post! I would have never known the difference!! I am not up on them. Only if it a Beaver as you can tell by the tail. My favorite too! ;) Hope you don't have too many more! Good thing it's on your property because I'd have to train it, and feed it and keep it as a pet. Ok...seriously....some things need to die!!!! Crazy. And it makes me think of The Chronicles of Narnia. Except they were Beavers. But you have woodchucks. Are they all related? this was a riot....laughing out loud...the picture with the cage is his mouth...holy cow he wanted out!! !